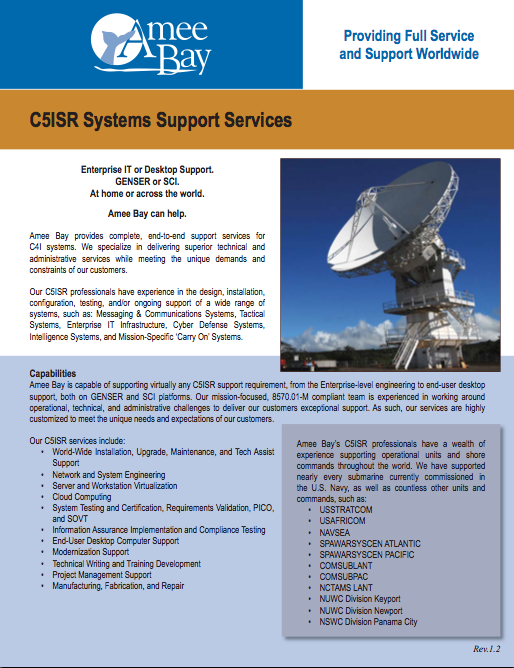 Amee Bay provides complete, end-to-end support services for C5ISR systems. We specialize in delivering superior technical & administrative services while meeting the unique demands and constraints of our customers. Amee Bay’s C5ISR professionals have experience in the design, installation, configuration, testing, and/or ongoing support of a wide range of systems, such as: Messaging & Communications Systems Tactical Systems Enterprise IT Infrastructure Cyber Defense Systems Intelligence Systems Mission-Specific ‘Carry On’ Systems. Amee Bay is capable of supporting virtually any C5ISR support requirement, from the Enterprise-level engineering to end-user desktop support, both on GENSER and SCI platforms. 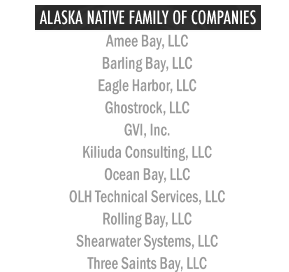 Our mission-focused, 8570.01-M compliant team is experienced in working around operational, technical, and administrative challenges to deliver our customers exceptional support. As such, Amee Bay’s services are highly customized to meet the unique needs and expectations of our customers. Amee Bay’s C5ISR Systems Support Services is a key component in our mission to provide end-to-end project support for C5ISR systems. In addition to our C5ISR Systems Support Services, Amee Bay is experienced in providing Hull, Mechanical, and Electrical (HM&E) support, as well as Information Assurance (IA) design, implementation, and support. Amee Bay’s C5ISR professionals possess a wide variety of operational experience, technical knowledge, and industry certifications. Our people have supported DoD C5ISR systems on units while pier side, in dry dock, and underway. Also, our C5ISR staff is experienced in providing support for shore commands, lab environments, and forward-deployed expeditionary bases.